If you are going to use accessories in your physical training, your most ergonomic choice have to be resistance bands or ab wheels. We have already featured an article about the Top 10 Best Ab Wheels of so today we are going to focus on resistance bands. You can start with a single band, for the smallest possible initial investment, and can grow to own as much as dozen resistance bands, and you will still be able to store everything in your sock drawer. Interestingly enough, although the bands themselves are so small, they can be used to put every inch of your body through a very intense workout. You can find most of these exercises described on dedicated websites, but most of the products we have decided to feature in our top 10 best resistance bands of come with their own instruction books, website access or DVDs. So make sure to scroll past the list itself and to the in depth description of each product. The most expensive item on our list also happens to be the best and there are 2 good reasons why we decided to start with it. For one, it represents the complete set of resistance bands that you will ever need, starting from being a couch potato, to becoming a beef cake. The second reason why we love it so much is that Bodylasting are using continuous dipped Malaysian latex, which basically means they are using the sturdiest, most efficient materials possible. However, they are taking no chances that the tubes will snap while you are working out, and there is a rigid cord running thorough the tube that will take up the release energy in case anything snaps. 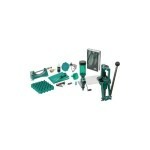 Of the 14 pieces in the set, 6 are just the exercise tubes themselves. 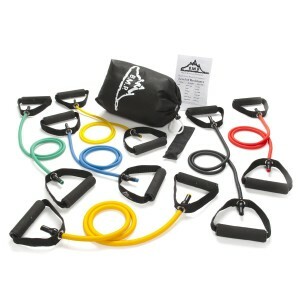 They allow you to vary the intensity of the workout from 3 to 142 pounds, and you get 3 different sets of grips, that will greatly extend the safety and number of various exercises you can do with this set. 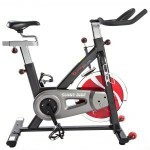 And you can further increase the range of exercises by choosing one of the top 10 best power towers of we have already featured. Although the Bodylastic offer makes the most sense in terms of what you are getting for your money, the truth is that, even if you follow an intense workout regime, you will not need to upgrade your resistance level that often. 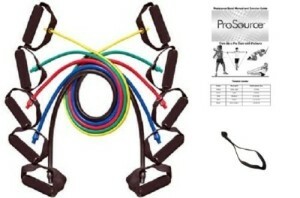 For that reason, our second most favorite product is the ProGrade Resistance Bands. With them you get the same, high quality level dipped latex band, but you only get one of them and, therefore pay less than a third of what you would pay for the Bodylastic package. It is debatable if you should make a larger investment from the start, or if you should drag out buying new bands, pay less each time, but overall spend as much as 3 times the price of the Bodylastic. However, the one thing that is true is that more than 60 customers have bought the ProGrade Resistance Bands and were happy enough with the results to award it a 4.8 star rating on Amazon. 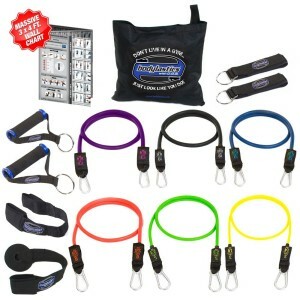 Considering the offers on the market and the actual needs of an average person using resistance bands, the best offer on the market today is the Bodylastics 12 pcs Snap Guard Resistance Bands Set. It costs just 2 times the price of the ProGrade, but it comes with 5 resistance bands made from that continuous dipped Malaysian latex, with the snap guard system. You still get the 3 different sets of guards and you get a 3 months access to the LiveExercise website and their 2000 live workouts. This offer too has a very impressive 4.7 star rating on Amazon, but that is coming from nearly 300 customers, almost 5 times more customers than the ProGrade. At this point you would be excuse if you decided to make a quick decision and just go with one of the products we have features so far. The only thing is that there are several other high quality products on the market and we feel obliged to talk about them too. 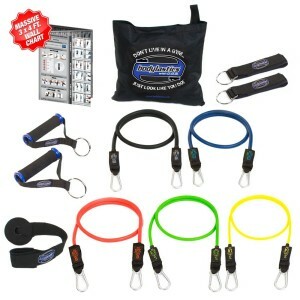 The Black Mountain Products New Strong Man Set of 6 Resistance Bands, for one, costs less than the equivalent package from Bodylastics and you are getting the same basic equipment, although it should be noted that the grips are all the same. The other thing to note, though, is that these bands are made from actual rubber, which is a more natural choice than the latex used in most modern resistance bands. 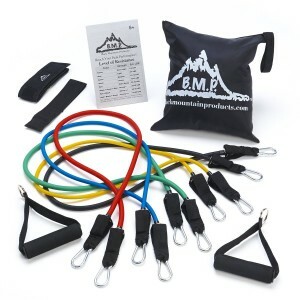 Interestingly enough, Black Mountain also have a set of 5 resistance bands that come with the various grips that you can find in the Bodylastics offer. This time though, considering that you are only getting 5 resistance bands, the price is basically the same with the competitor’s offer. The bands themselves do not have a snap guard, but the metal clips do look and feel a lot sturdier. It is also worth mentioning that you only get a set of the hand grips and just one door anchor and one ankle strap. You also get an exercise chart that will give you the basics of working with the entire set. 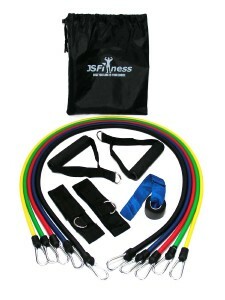 The JS Fitness Resistance Band Set is an even cheaper version of the Black Mountain offer we have just talked about. They offer the 5 color coded bands, made from latex and dipped tubes, and you also get a set of hand grips, and of ankle straps, but only one door anchor. The metal clips look sturdy enough, although not as strong as the Black Mountain ones, but you do not get any type of instructional chart or video. Of course, there are plenty of professional programs like the P90X, that can make full use of these bands and that would make any chart provided by the manufacturer, useless. 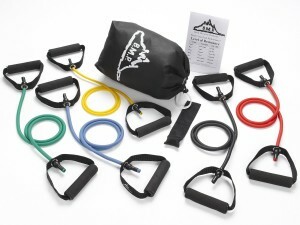 Following the trend of decreasing price, we now have to bring to your attention, the Black Mountain Products 5 Resistance Bands Set. The price is lower than ever before for a 5 band set, but the bands are attached to their grips, so it can be quite uncomfortable to pair even just 2 bands together for increased resistance. The exercise chart is back, and it can teach how to get the most from your bands, even though maximum resistance you will be able to get is from the red chord of 30 pounds. Still, you should consider that almost 600 customers have trained with this exact set and were happy enough with it to give it a 4.5 star rating on Amazon. Especially for women exercises, the concept of the resistance bands can be applied in a different form. The Aylio 3 Loop Bands for Exercise are actually 3 rubber loops of different resistance levels that you can use to strengthen most of your legs muscles. 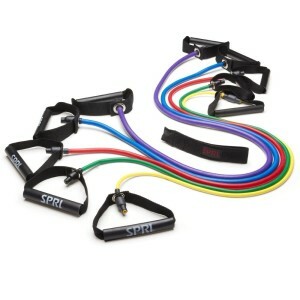 They can be used for a complete workout, but they are not as efficient for the upper body as a regular set of bands. 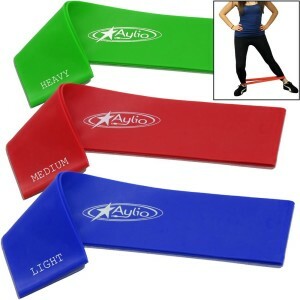 Still, we had to award them points for originality and that is why we decided to feature the Aylio offer on our top 10 best resistance bands of . There are 2 final products that we are going to feature on our list, both of whom are affordable but of questionable quality. That is not to say we do not think the ProSource 48-Inch Premium Latex Resistance Exercise Band Set will stand the test of time. The problem is you can see manufacturing leftovers on almost every piece of equipment. They do not subtract from the efficiency of the workout, but they may take away some of your enthusiasm to pick up your new resistance band set and start working out. The last product on our list is also the cheapest, considering that, for the price, you do get a 5 band set with a door attachment. Note the fact that we called it door attachment and not anchor, because it works completely different than the anchor and it can easily slip away from under the door and hit you. 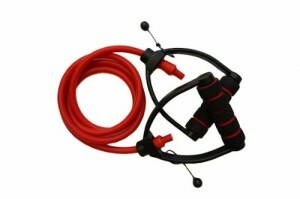 In fact this dangerous accessory is why we left the SPRI Xertube Resistance Band Exercise Cords for the last place on our list of the best resistance bands, and also why it has only earned a 4.2 star rating on Amazon.